On November 1, 1918, the worst transit disaster in New York City history occurred just outside Prospect Park and the Brooklyn Botanic Garden. The wooden cars of the Brighton Beach line of the Brooklyn Rapid Transit (B.R.T.) company left the tracks, crashing inside the tunnel beneath the busy intersection where Flatbush Avenue, Ocean Avenue and Malbone Street met [Google map]. The Malbone Street Wreck killed nearly 100 people and injured more than 250. Criminal trials and lawsuits arising from the accident dragged on for years, contributing to the bankruptcy of the BRT. The name "Malbone Street" became associated with the disaster; it's known today as Empire Boulevard. 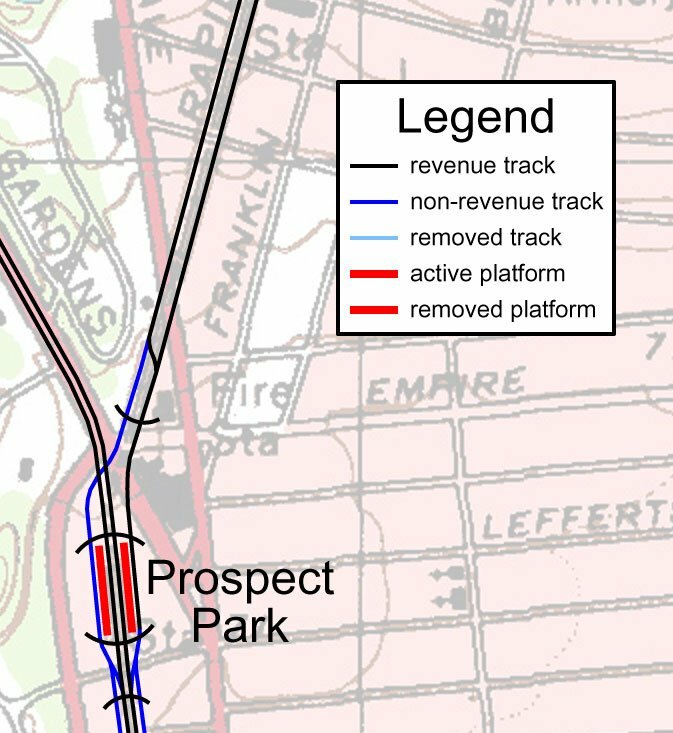 The BRT line followed roughly the current route of the B/Q subway lines from Coney Island to Prospect Park, and the shuttle from Prospect Park to Franklin Avenue. Conditions for the disaster were created by a number of factors. World War I, and the influenza pandemic, were still raging. A multi-year project to consolidate the BRT and then-IRT required temporary rerouting of several lines, creating a sharp turn into a tunnel beneath what is now Empire Boulevard, just north of the current Prospect Park station of the B/Q lines and the Franklin Avenue Shuttle. This turn, called "Dead Man's Curve" even before the accident, is still visible from the street today. As Edward Luciano began a run as motorman on the Brooklyn Rapid Transit's (BRT) Brighton Beach line on the evening of November 1, 1918, getting home quickly and safely might well have been foremost in his mind. Luciano's career as a motorman had started earlier that very day, when the BRT pressed the twenty-three year-old dispatcher into service after company motormen went out on strike. Weakened by a recent bout with influenza and emotionally anguished by the death of one of his children from flu the week before, Luciano nonetheless complied with his employer's wishes. The posted speed for the tunnel entrance was six miles per hour; witnesses estimated that Luciano's train entered the curve at over thirty. The train's first car hung precariously to the track, then derailed upon entering the tunnel. The second car slammed violently into a concrete abutment, losing its roof and one of its sides in the impact. The third car disintegrated into a tangled mass of wood and glass. The Malbone Street train sits in the BRT's 36th St. Yard after salvage. The relatively minor damage to 726 [the first car in the photo] shows why most in the first car escaped serious injury. Even the window of Motorman Luciano's cab (left, front) is intact. Not so lucky were those in trailer car 80 immediately behind, with half the car sheared away. Behind 80 is motor car 725, also almost unscathed. Chillingly absent between 80 and 725 would have been car 100, the remains of which were dismantled at the scene. The accident occurred during the evening rush hour. It was already night-time. In the closed confines of the tunnel, rescuers tried to save who they could. It was a horrific scene. Dozens of passengers died immediately, many of them decapitated or impaled by shards of wood and glass. Others were electrocuted by the third rail, which had shut down on derailment but was turned back on by offsite monitors who attributed the shutdown to labor sabotage. [Note: The claim of death by electrocution is refuted in Cudahy's book.] Rescuers rushed to the station, to help the dazed and injured and to carry away the dead. The power failure in the tunnel posed a problem for rescuers that was partially solved when automobiles pulled up near the entrance to the station to illuminate the ghastly scene. Worried friends and relatives came from across the city and waited outside the station for news of loved ones who frequented the Brighton Beach trains. Medical personnel used the Brooklyn Dodger's Ebbets Field as a first aid station. And Mayor John Hylan, a strong opponent of privately operated transit lines like the BRT, arrived on the scene with freshly-milled accusations of transit-interest malfeasance. Newspapers of the day published the names and addresses of those killed and injured in the crash. From that, I created a Google Map with the names and addresses of the dead. The geographic distribution is striking. The majority of those killed were from greater Flatbush, including Prospect Lefferts Gardens, but also included victims from East Flatbush and Kensington, to the east and west, and, to the south, from Midwood, Gravesend, and Sheepshead Bay. Here's the list of dead and injured. Most of this list is presented as it was reported in the Brooklyn Standard Union on November 2, 1918, the day after the crash. I made other edits and corrections from additional sources, such as follow-up articles in the new York Times. Some information was originally printed in error, some of the injured later died, and one man originally listed as dead was found to be safe at home. Where available, the addresses link to the Google Map I created which shows the homes of the victims. Some victims also received short descriptions in the paper of the time; I added that to the descriptions of the markers.